Keegan will be in charge of FCA's corporate and product communications. 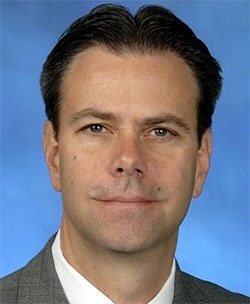 Fiat Chrysler Automobiles appointed 25-year veteran Mike Keegan to lead the company's North American communications, a new position, effective Thursday. Keegan, who was most recently head of North American human resources for FCA, will also oversee the company's investor relations activities and continue to coordinate the automaker's Group Executive Council. "Mike brings a wide range of experience across our organization including roles in Finance, Sales, Supply Chain Management and Human Resources," CEO Sergio Marchionne said in a statement. "This background, along with his lifelong association with the industry and company makes him the ideal person to coordinate communication of FCA's culture and values and to support our brands, new products and technologies, as well as our regional business operations." Barbara Pilarski, 54, FCA's vice president of business development, takes over for Keegan as head of HR. Pilarski is a 32-year veteran of FCA. Keegan, who will report to Marchionne, will be in charge of FCA's corporate and product communications and remains based at FCA's North American headquarters in Auburn Hills, Michigan.